The Bloomberg Harvard Class of 2017–18. Next week, 40 mayors from cities across the U.S. and around the world will start a yearlong professional-development program tailored to the challenges of governing a city. They’re the second group of mayors to get this executive training, aimed at sharpening their leadership skills. They’ll get the sort of experience that most corporate CEOs take for granted but remains rare in the public sector. Starting with a three-day program in New York and continuing through a year of virtual classroom sessions and coaching, the new class will analyze cases of public-sector success and failure, explore smart ways to take risks, improve how they use data to solve problems and innovate, and motivate others to engage in collective action. 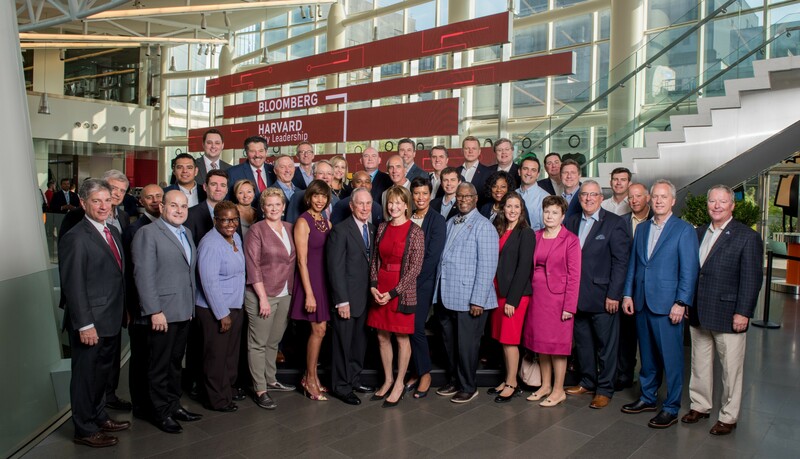 The program brings together the expertise of Harvard Kennedy School, Harvard Business School, and Bloomberg Philanthropies to support these mayors and their leadership teams. City leadership comes from both the head and the heart. Leveraging limited resources to make significant impact is a key challenge for all mayors. This requires strategic thinking and analysis of what the problem is, which responses work, and which do not. Mayors increasingly see the value of using data and evidence to make decisions. Solving problems requires leading both inside and outside of city hall. As public-sector leaders, mayors must wear two hats. In the office, they have to engage their staff in driving the performance of the government. At the same time, as the public face of the city, they engage the broader community and mobilize the whole city to address important issues. A number of mayors in the program said they’ve reworked their approach to managing, to establish a more inclusive culture, effectively delegate, and encourage collaboration across departments. It helped that each mayor was able to send two high-level officials to Bloomberg Harvard programming for senior city hall leaders throughout the year. But city hall can’t do it all. Solving tough problems often requires combining resources and expertise from multiple sectors: the business community, nonprofits, universities, philanthropy, and others. Mayors are looking to hone their cross-sector collaboration skills. Ten cities took a deep dive at this and sent cross-sector teams of eight people each to New York for specialized training on the art of forging effective partnerships across multiple sectors and organizations. Good governance involves both smart risk-taking and prudence. Taking risks in the public sector can be tough. Media and critics are quick to pounce when a mayor’s idea isn’t working out as planned. Of course, nobody likes the notion of “gambling” with taxpayer’s money. And yet, sometimes the biggest risk is doing nothing at all. The old aphorism that insanity is “trying the same thing while expecting different outcomes” certainly holds true for government. Mayors realize this and are eager to innovate while minimizing the risk of failure. A number of mayors have taken the opportunity to create space for small experiments that can lead to big changes. These mayors are learning to break the habit of rolling out big programs and policies and then hoping for the best. Instead, they’re trying out more iterative approaches, where they test out an idea, learn what does and doesn’t work, and then adapt it. This process of prototyping solutions actually reduces risk, saves taxpayer money, and gets the public engaged early. Great city leaders pursue bold ambitions but also master the basics. Mayors are uniquely positioned to advance the sort of dialogue that can set a long-term vision for what a city wants to become. Mayor Greg Fischer of Louisville, Ky., talks of building a “compassionate city” that takes care of all citizens. Philadelphia’s Jim Kenney reclaimed local control of the city’s school system from the state, assuming accountability for better outcomes for Philly’s kids. And Dan Horrigan of Akron, Ohio, has set the mantra “Why not Akron?” to argue that the Rust Belt city should thrive rather than merely survive as he pursues new economic-development partnerships and builds a new community college. While vision and courageous leadership are crucial, citizens expect potholes to be filled, trash to be picked up, and snow to be plowed on time. As Mike Bloomberg likes to say, a mayor’s job is ultimately to make sure that all the basic services are well-delivered. The credibility of a vision for the future for a city depends on a mayor’s ability to deliver results in the short term first. While mayors do not typically have the time or expertise to get into the weeds of their operations, they are ultimately responsible for the performance of their organization. Consistently, the mayors in our program have asked: What questions should I ask my staff and my stakeholders to learn what I need to know and to motivate them to do what they need to do? Performance leadership is not just a matter of holding staff accountable. It is equally important to create an environment where those with the greatest insight are encouraged to speak up and contribute — and where the organization as a whole, from frontline to top management, learns. The mayor’s job, then, is to create conditions for collaborative learning, ask the right questions, demand and interrogate the data, and bring teams together across silos. Celebrating public sector progress and innovation in cities around the world. Run by @BloombergDotOrg’s Government Innovation program.